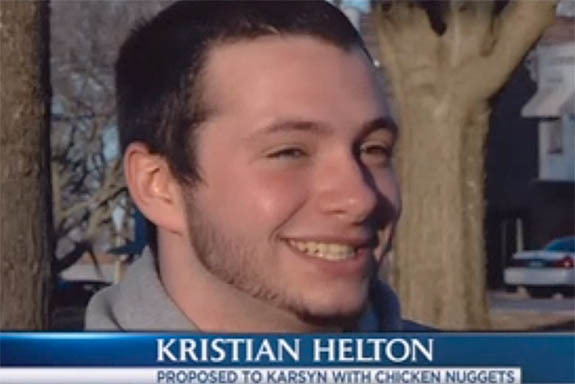 When Lincoln, Ill., native Kristian Helton was plotting the perfect way to propose to girlfriend Karsyn Long on Valentine's Day, he knew that McDonald's Chicken McNuggets had to be the focus of the plan. You see, Long absolutely loves, loves, loves the crispy batter-dipped morsels. 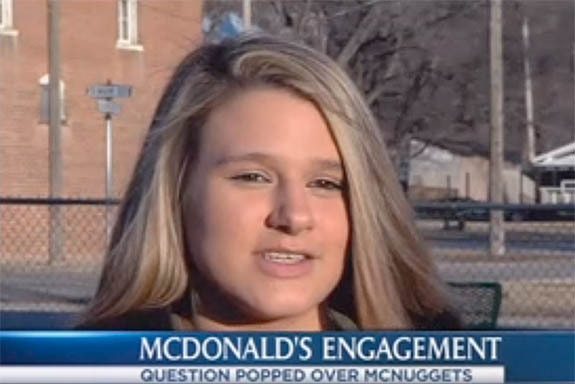 "She has devoted her life to chicken nuggets," Helton told NBC affiliate WAND, "so that had to be part of the engagement. I mean, it was just a given." "Her love for chicken nuggets I'm sure is more than she loves me," Helton joked. Excited to get a jump on his plan, Long headed out to his local McDonald's at 7:30 a.m. He ordered the large box of nuggets, but was told that it was way too early to get food off the lunch menu. Armed with the nugget box, which would double as a ring box, Long had only a few modifications to pull off. On the inside cover of the box he wrote in orange marker, "Will You McMarry Me??" And then he pressed a pretty solitaire engagement ring into one of the nuggets. Long, 16, was thrilled to accept Helton's proposal. "I didn't hesitate to say yes because he is obviously the one I want to spend my life with,” Long told WAND. 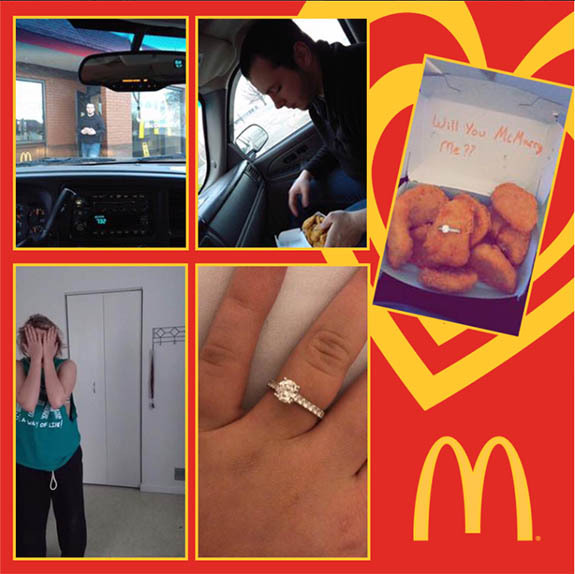 The local McDonald's was excited to share Long's Facebook post, where she included a photo collage and a description of the events leading up to the proposal. McDonald's included an intro that read, "Love is in the air at your Central Illinois McDonald's! 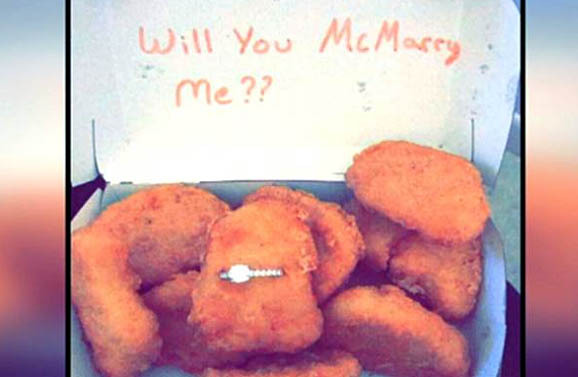 The Lincoln, IL McDonald’s was instrumental in helping pull off a very McRomantic engagement. Check out how he asked below:" The fast-food restaurant also congratulated the future Mr. and Mrs. Helton and wished them a Happy Valentine's Day. This is how Long described her unforgettable day... "This morning at 7:30 a.m. my boyfriend went to McDonald's and they don't serve lunch until 11 or so and my boyfriend asked for a 10-piece chicken nugget and they told him they don't serve [nuggets] until lunch. Well, my boyfriend said I'm proposing to my girlfriend and she's a crazy nugget girl! And they made him chicken nuggets and gave them to him for free... It was the sweetest thing ever. Thank you so much McDonald's. I'm one happy girl now!!!" The story of the couple's sweet, homespun, deep-fried marriage proposal has gone viral. The story was picked up by Today.com, Fox News, Brides.com, the New York Post and numerous other media outlets. Helton and Long are planning a Valentine 2018 wedding. It's rumored that McDonald's has offered to do the catering. Screen captures via wandtv.com, today.com; McDonald's collage by Kristian Helton via Facebook/McDonald's at 1109 Hickox Dr.